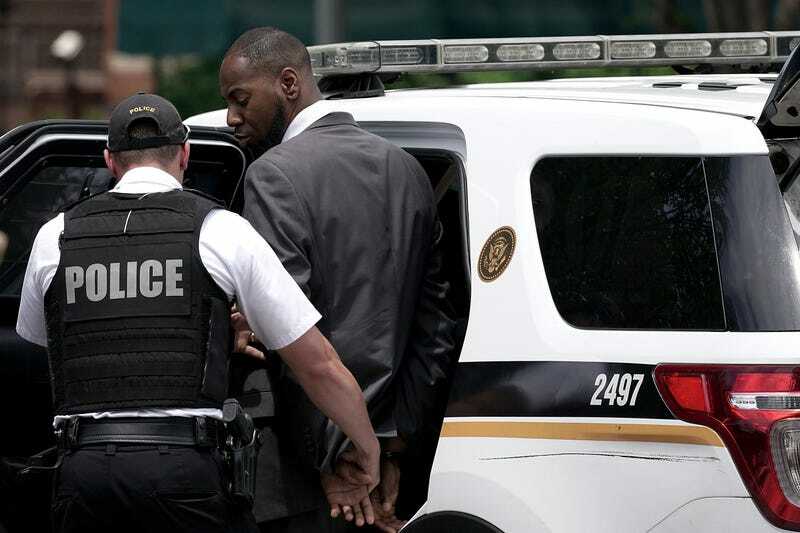 Martese Edwards, 29, is arrested by members of U.S. Secret Service Uniform Division outside the White House on June 5, 2018, in Washington, D.C.
Police arrested a private contractor working at the White House on Tuesday afternoon after the Secret Service discovered that he had an outstanding arrest warrant in Prince George’s County, Md. According to the Washington Post, Martese Edwards, 29, was taken into custody at the checkpoint at the 1600 block of Pennsylvania Avenue NW; and while the Secret Service didn’t say what Edwards was charged with, a PG County source told the Post that a man with the same name was wanted on an attempted first-degree murder charge. A spokeswoman for the Prince George’s County Sheriff’s Office told the Post that a warrant was taken out May 17. A Washington, D.C., police report noted that when Edwards arrived at the checkpoint, his name was run through a criminal database that showed there was an active warrant, which led to his arrest. Edwards was “charged in the District with being a fugitive from justice and could later be extradited to Maryland. The Secret Service said he worked as a private contractor, but his precise job or where he worked at the White House was not provided,” the Post reports.